Title: Some inconvenient truths about ‘biosignatures’ involving two chemical species on Earth-like exoplanets. The combined spectrum of a lifeless exoplanet and its lifeless moon could look uncannily like a single planet in thermochemical disequilibrium: a smoking gun sign of life. With the James Webb Space Telescope (JWST) launching in 2017, the search for alien life on extra-solar planets is about to ramp up. Since JWST won’t have a good enough ‘zoom’ to provide us with Google-maps style images of alien civilisations, we have to infer their presence by studying the spectral signatures of exoplanets. Indicators of life on other planets are called biosignatures. Thermochemical disequilibrium is thought to be a pretty convincing biosignature and it could be detectable in the atmospheres of directly imaged planets. Molecules like oxygen and methane tend not to coexist in large quantities for long before the methane oxidises to become water and carbon dioxide. For these two chemical species, disequilibrium will only come about when gas is constantly pumped into the atmosphere by the metabolic processes of living organisms (for example). 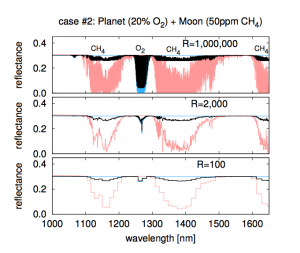 Unfortunately, if an Earth-sized exoplanet with an O2 atmosphere has a moon with a CH4 atmosphere, the composite spectrum of the two could look a lot like the spectrum of a single planet in disequilibrium. Figure 1. 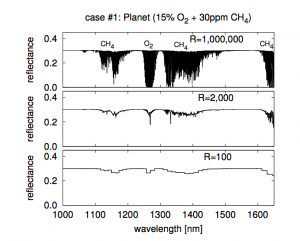 The spectrum of an isolated exoplanet with 15% O2 and 30ppm CH4 at three different resolutions. To demonstrate the potential for biosignature mimicry, Rein et al generate synthetic spectra for two scenarios. Figure 1 shows the spectrum of an isolated planet with an atmosphere of 15% oxygen and 300 parts-per-million methane at three different resolutions. Figure 2 shows the combined spectrum of a different planet and its unresolved moon in black, with the individual planet’s spectrum in red and the moon’s spectrum in blue. This planet’s atmosphere has 20% oxygen and the moon’s has 50ppm methane. The two bottom panels of figures 1 and 2, showing the lowest resolution spectra, look uncannily similar: at this resolution the two cases are indistinguishable. It is likely that even state-of-the-art up-and-coming instruments like JWST will have a ‘best-case’ resolution of around 1600 for an Earth-twin. That’s a little worse than the central panels of figures 1 and 2 and already the spectra are not easily distinguishable. Thus, an isolated planet with aliens and a dead planet with an unseen moon might be impossible to tell apart. It gets worse: the authors of this paper use a simple model, with only two molecular species, as a proof of concept. In reality spectra will probably be more complicated than this, with lots of other chemical species (such as water) confusing things even further. Figure 2. 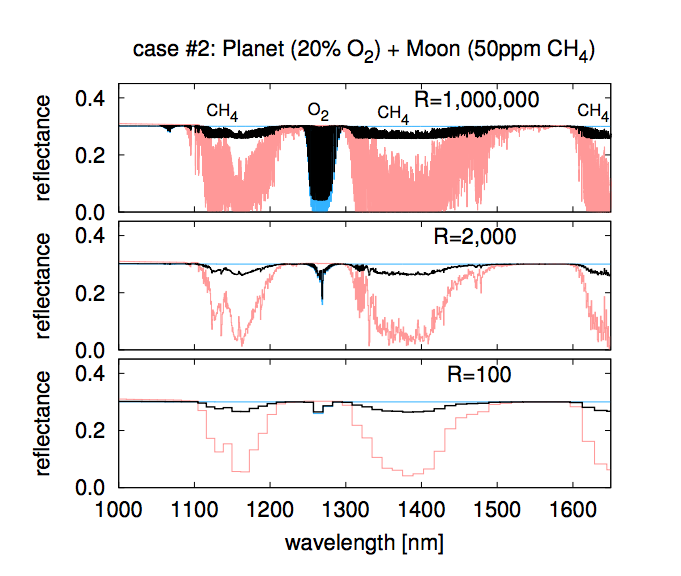 The spectrum of a planet with 20% O2 (red) and a moon with 50ppm methane (blue) and the combined spectrum of the two (black), at three different resolutions. This research stands as a warning: we should be very careful when interpreting the appearance of thermochemical disequilibrium in the atmosphere of an Earth-sized exoplanet. Unfortunately, it is pretty difficult to ever entirely rule out the presence of a moon. Perhaps we should turn our attention to less ambiguous biosignatures? Certain gases, if present in a great enough volume, are thought to be good indicators of life – molecular oxygen and ozone for example. However, we have to be pretty certain that such gases aren’t being produced in large quantities by abiotic processes such as geothermal activity, photochemistry and meteor impacts. Another potential biosignature is an excess of flux at the red end of a planet’s reflection spectrum, which is characteristic of vegetation. However, both of these alternative biosignatures will be extremely difficult to detect in the low signal-to-noise spectra of Earth analogues. We might just have to be patient. Future space missions like TESS and PLATO will look for transiting planets around nearby, bright stars. An Earth-sized planet in the habitable zone of one of those might just provide a spectrum with high enough signal-to-noise to rule out lunar interference.